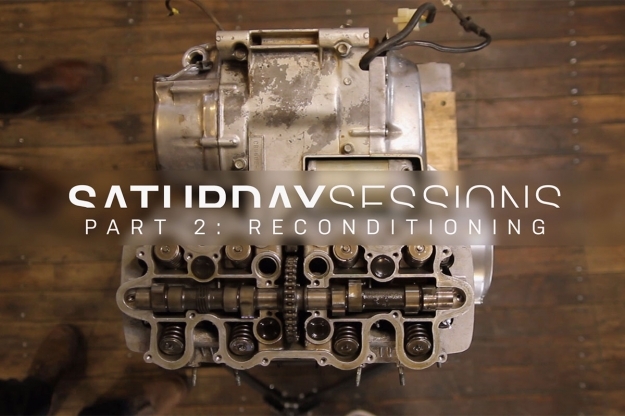 In last week’s Saturday Sessions, we saw E3 Motorcycles tearing down a Honda CB550. This week, it’s time for the messy business of motorcycle reconditioning—inspecting, bagging, and tagging the dismantled parts. This CB550 is owned by New York agency Woods Witt Dealy & Sons, and was a lot cleaner than most E3 projects. But it still needs replacement parts—plus all the attention that classic motorcycles typically require. In this latest video we see the metal parts being prepped for blasting and powder coating, the wheels being disassembled for a full rebuild, and the carbs and front end being readied for an overhaul. We also see the start of the engine breakdown, with covers pulled for polishing. E3 will also be pinning down the source of oil leaks.